Ark View brings all the news from your favorite websites and lets you easily organize it under one place, so you don't have go to anywhere else. No more zig zagging. All the content comes to you in one place, in a clean and easy-to-read format. Because it is powered by RSS, Ark View is an open system: you can add any RSS feed and read it wherever you go. Faster access to lots of different sources of news and information means that you can more easily keep up with important trends or topics you really care about. From tech to business, design to marketing, media and beyond, Ark View helps you discover great feeds that you can organize in and read in one place. It also comes with Twitter Integration so that you can view and interact with tweets directly within the app. 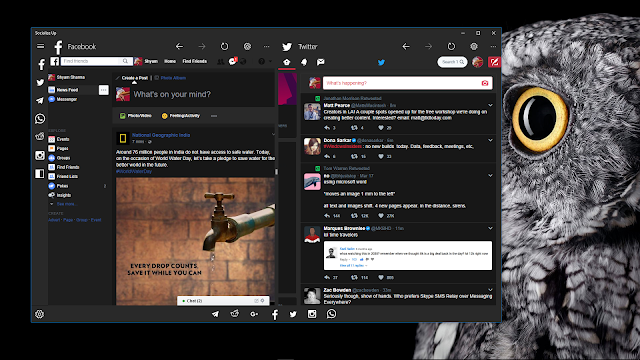 Ark View is also supports Multiple Themes and Fluent Design too so that you can enjoy the experience beautifully. Make sure to try it yourself, may be you like it! As always, Thank you very much for taking your time to read this. Socialize up finally made into Windows Store. 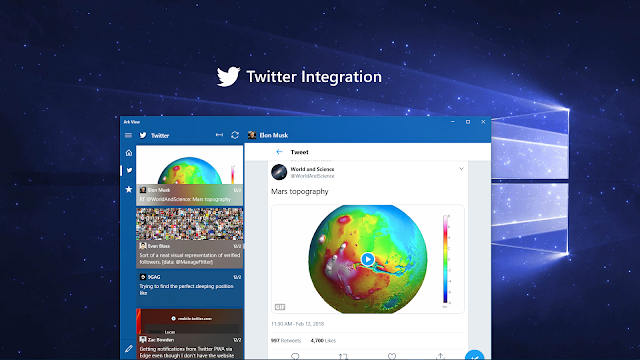 Meet the all new Socialize up app for Windows 10. We have to build it from scratch to make it more faster and better and that's what made it took so long. Socialize up is one of my personal favourite app that I love to use and to build it too along with One Messenger. So without wasting any more time, lets take a quick look at some of the new features that has been added into Socialize Up. Facebook which is almost used by everyone has been re-designed on Both Desktop and Mobile devices. A much clean and beautiful interface than before. 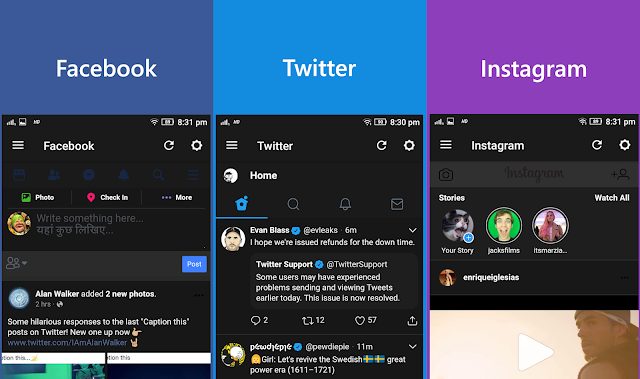 There is a dark theme which really helps in relaxation of your eye balls. We will continue to update the UI of facebook daily. Facebook on Mobile also look quite beautiful. Here's a quick look of Facebook running on Desktop! Here's Twitter running on Desktop. There is also new UI present for Whatsapp, Instagram and more in Socialize up which I hope you will love it. You can try that by yourself in Socialize up. 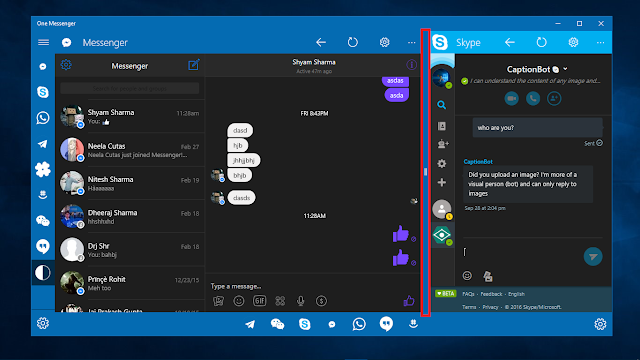 Split View is one of favourite feature of Socialize Up. As you can see above, it really helps in managing two services at once. 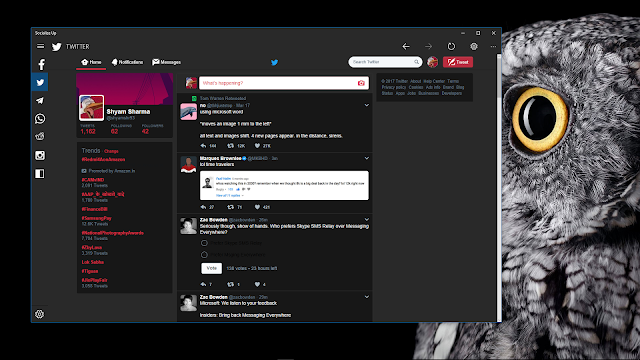 I can always chat on Facebook and can browse my twitter feed on the other side and vice versa. There is Splitter present in the page too which helps in adjusting the width of both sides. There is also other services present in the page other than facebook and twitter. Let's take a look at some of Settings. Let's start from the top of the page. At the top there is button that lets you clear temporary files, login details and caches. After that there is option to refresh In-App Purchases License which comes very handy when it is not working for you. Below it, There is a option to hide the Nav Pane or Menu bar(Hamburger Menu) which you see on the Main Page. 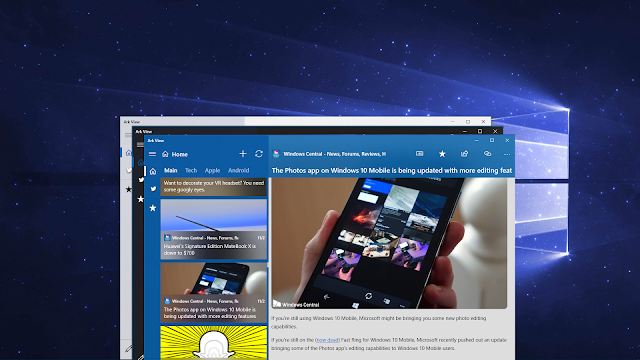 If you want to Hide the Hamburger menu from the Main Page you can easily do it with that. Really helps in making UI more clean. After that There comes the Security Section. Socialize Up Supports both Custom Password and Windows hello. 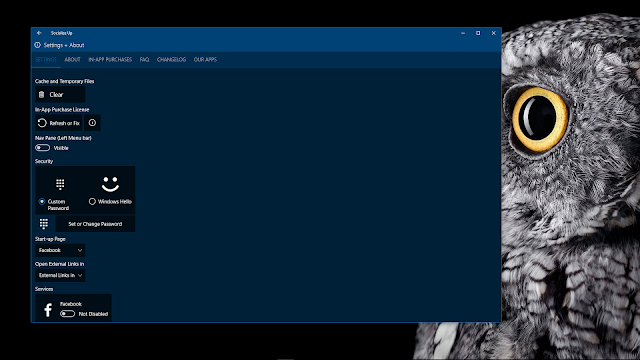 Windows Hello is one of the best security feature an app can have, therefore we have built it into the app. We have also re-designed Custom Password UI. Here's a look at it! So Cleannnn!! Below Security section, There is option to set Start-up Page, option to set where to open External Links and option to disable services you don't want to use. I think there is no need in explaining these option as they self explanatory. Today we releasing a Big Update for One Messenger which is available to download right now. Before we jump into What's next for you and us, I would like to talk about the update which we have released today for One Messenger. First of All, Thank you very much for your Support and love you have given to us. I was not able to Update any of my app recently and I apologize for that. Today's Update changes that I am working on updating my other apps and you will receive a update from all of my App very soon. stay Tuned for that! We have Re-Designed our Settings Page. Settings have a much cleaner and streamlined User Interface than Before. I hope you will like it! Added Slider in Split View page to adjust the width of each pages. Make sure to try it out! It allows you to adjust the width of any side very easily. You can a idea of that by looking below. Added Windows 10 Anniversary Support. Microsoft fixes the Copy Function in Anniversary Update which was broken in previous version of Windows so that means that Copy will now work very properly. Thanks MS.
Added Option to Remove Custom Password. If you a custom Password in One Messenger, you can now easily remove it. Go to Set or Change Password => Remove Password and Done! We also added What's new Box everytime you update the app, so you never miss to know about new Improvements and Features we have added! Small UI Changes all over in App. You will see a much better and clean UI than before. 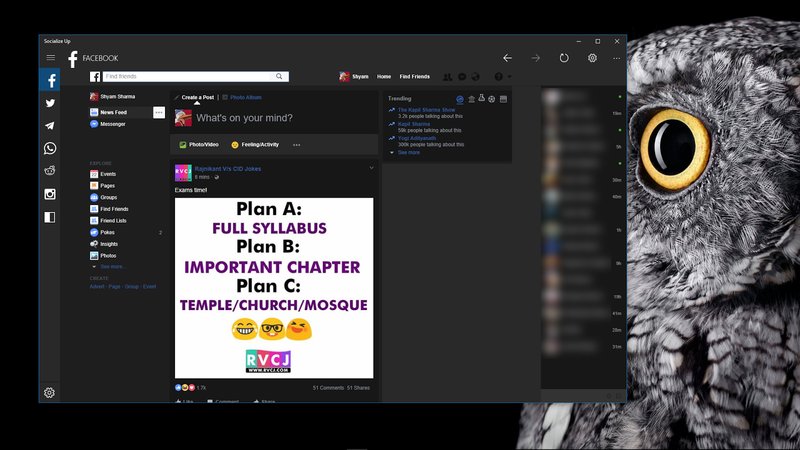 New Dark Mode for Skype. Enable it from Skype Settings Menu. New Animations in App. Smooth and Clean Animations when switching Between Pages. You will able to switch between Pages faster than before. We have made a couple of Improvements in performance of the app. Updated Get New Apps Section. Whats a better to support us than by downloading our other apps? so Make sure to Download our other apps too. Updated FAQ Section. Fixed some typo and added new question. Well, that was all the Changes I have made in App in couple of days. As always if you want to show some support, Please make sure to rate us on Windows Store. I would like to start this with Socialize Up. 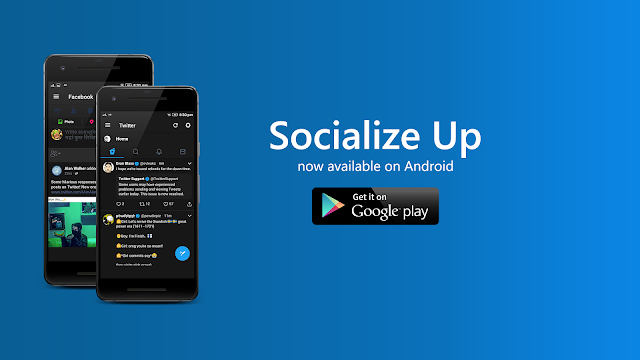 For those who knows that One of our Apps "Socialize Up" is missing from Windows Store for a couple of months. 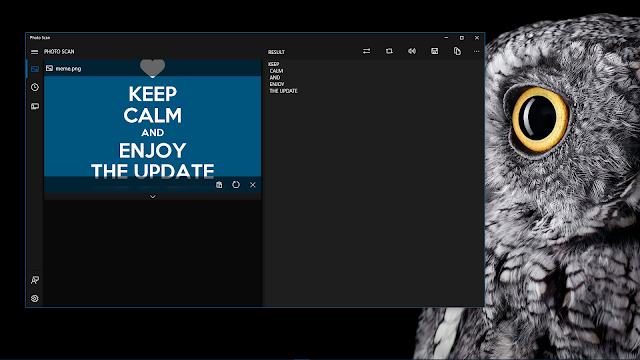 I would like to tell you that Socialize Up will return to Windows Store soon and No, we didn't removed it from the store , Microsoft did it due to some copyright issues which is resolved now so You can expect it to return to Windows Store soon. I am thinking of a new User Interface for it which I haven't decided yet so it may take long to comeback. New Socialize Up will surely have a New Logo and many new Features compare to previous one. Now I would like to talk about my Other Apps. I am planning to update Cloud Drive next and then Flow Mail because they haven't been updated for long and I am very excited to add new things in it. So Stay tuned for that and after that I Will update the remaining apps. Our App Photo Scan was released in Windows Store a month ago and after that we released the first Major Update for it and I was blown away by the response from you guys! I really want to thank you those who rated and reviewed us on Windows Store. Thank you for all your awesome responses and feedback about Photo Scan you have mailed us. Well that's all for now, I hope you will continue to give us all the love and appreciation you have given till now. It really helps us to continue build new and improve current apps for you and it also helps us to continue learning new things so that we can improve your experience. We will continue to deliver new updates and build new apps for you. Updated : Ratings of Music will now be in Stars instead of number as expected. New: Added Option to Set up Startup Page. Fixed : Removed the Notifications you get when Metadata/Id3 Tag is Changed/Updated cause it was annoying instead added Flyout to Show it. If you love using our app, Please make to rate in store. If you haven't downloaded the app yet, Download it now and try it Yourself Auvid Tuner for Windows 10. Fixed : You will see crashes after this update! With Latest Update you can add new Tabs where you can view or edit your document with out having to close the current app . You can add up to 10 Tabs. This can very useful in many Ways. Nextpad is now par with Classic Notepad you found in Windows and ahead of many things that classic notepad can't do but Nextpad can. Flow Mail is the best, light-weight Mail App for Windows 10. Flow Mail lets you create and view your Outlook Mail, Google Mail , Yahoo Mail and More. Manage your mails with Flow mail without having to open Multiple Apps or Browsers. Flow Mail is a Beautiful app to Manage, create, view or delete your Mails very easily and efficiently. 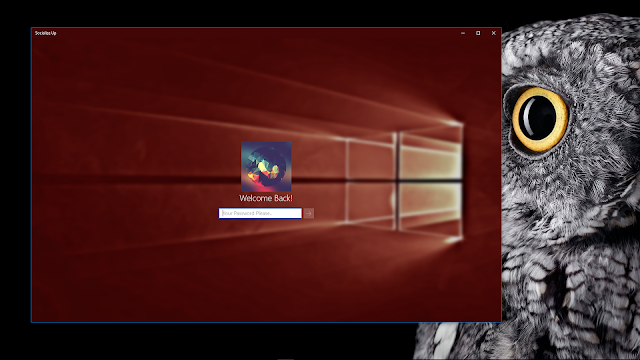 Set your own password or use Windows hello to protect your app from others. We have just updated the Auvid Tuner. The New Version of Auvid Tuner have added many new and most requested features. We have added Slider to Edit or Trim your Music or Video File. Now you can edit your file using slider. We have added all new way to edit your Music Metadata or Music ID3 Tags very easily and efficiently. We have also Updated the User Interface for Password Settings. Added New Progress Indicator to see the Progress of the file you are trimming. Fixed Bugs all over in app! You will see very less crashes in app after these updates. Update Will be Live soon. Update is Live, Go Download it! Nextpad is the Simple Yet Powerful and lightweight Notepad App for Windows 10. Nextpad helps you create, edit, view or print your file very easily and efficiently. Nextpad is fast, responsive and reliable notepad. No one wants a slowish notepad. Therefore, Our first Priority was to made Nextpad fast and responsive and Yes, we Nailed it! Nextpad also supports Printing too which means you don't have to go to anywhere else to print your file. Nextpad supports almost all text file format and even some extra formats too like full rtf file support! Nextpad is better and different from other notepad available in store, How? It has pretty good features that other notepad apps don't have and that's what makes it different from others! Speaking of features Nextpad has tabs support. You can create multiple tabs to manage other documents while working on another one without having to leave the app. It supports text to speech means it will read out all the document for you and speech to text means you can just talk to app and it will write it for you in document. It lets you share the file or text with other apps. it also has bunch of cool features like Pick up where I left off which means that you are never going to lost what you typed in your document before saving it. you will find your unsaved document next time you open it! These are just some of features that we have talked about but you will find many more useful and cool features when you will use it. Nextpad lets you edit and style your text like making text bold, italic, change your font and more... With Built-in find/replace , you can find or replace words in your document very easily! • Full Rich Text Document Support. • Supports Speech to Text.